I recently participated in a debate, hosted by the IEEE Communications Society, about the pros and cons of IoT standardization. My debating counterpart was the North Americas President of SigFox, a company that has so far raised over US$150m. SigFox is in the process of deploying its proprietary networking technology in 18 countries specifically for the purpose of energy-efficient and low-cost IoT applications. Much of the debate and several of the audience questions focused on the worry about standards proliferation in the IoT market. This creates a confusing picture for business that have to make long-term product development decisions. My observations on the issue of IoT standardization were fourfold. Firstly, standardization is important to the future success of the IoT market. Many businesses, standardization bodies and industry alliances are sufficiently convinced about the benefits of IoT standardization to have invested significantly in such efforts. The strategy and product-development issues for the wider market are all about understanding how these different standardization attempts fit together. Specifically, how do these initiatives map onto the IoT value chain and what is their path to market implementation? This is a topic from one of my earlier posts . My second observation dealt with the challenge of identifying a focal point for IoT standardization. Much of what passes as an IoT standard is actually a re-branding of existing standards and guidelines under the IoT label. A long-list of standards I saw some months back listed floating point arithmetic as an IoT standard! This line of thinking is unnecessarily confusing and simply adds to the standardization noise in the market. Many technologists and industry bodies are promoting their communications protocol or technology as the right one for IoT. What this message overlooks is the fact that the majority of IoT applications will involve a wide range of sensors and connected devices. These will be hybrid solutions, employing standards-based and proprietary protocols communicating over a mix of fixed- and wireless-network technologies. The right place to focus IoT standardization is in enabling interoperability across mixed-populations of devices, gateways and sensors, irrespective of underlying networking and protocol standards. This is where the work of the oneM2M™ Partnership Project is so important. In fact, Machina Research recently noted  that there is only a single standard, oneM2M™, at the service layer to support IoT applications. That’s as uncomplicated as standardization gets. My third observation addressed the concern that many businesses and market commentators raise about the lengthy period of time it takes to formalize a standard. Using the mobile industry as a proxy, its track record of standardization demonstrates progressive improvements over the past few decades. 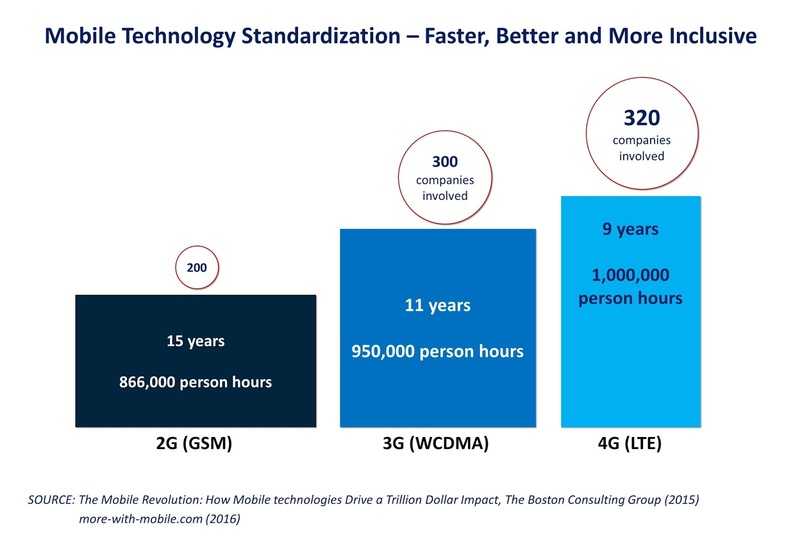 In fact, 4G standardization has taken less time to produce a more advanced technology standard, relative to 2G and 3G, through a process that is more inclusive involving over 320 participants. In fact, the 9 years to produce the 4G standard is not so different from the 8 years that the low-power, wide-area networking company Ingenu  took to create its proprietary IoT solution. What the simple comparison of mobile and Ingenu standardization doesn’t show is the importance of an institutional framework to create and to maintain a standard. No technology remains static; evolution and innovation are constants. The absence of an institutional framework and set of procedures to manage progress and integrate innovations is a major risk factor for any proprietary offering, more so if it is only available through one supplier. This is the point I illustrated in my fourth observation. Revolv  was an early mover in the connected-home market. Revolv worked well for a few years until its acquisition and integration within Nest under the Google corporate umbrella. Unfortunately, for its customers, Nest’s product development road-map took precedence to a degree that precluded any resourcing to maintain Revolv. According to its web site, Revolv’s management team wrote that “As of May 15, 2016, your Revolv hub and app will no longer work”. Revolv’s story is a salutary lesson for companies investing in long service-life IoT solutions and who assume that their supplier will continue in business. This is no different to the many Revolv subscribers who purchased lifetime subscriptions  without much of a second thought. An important lesson for organizations concerned about their IoT strategies and the role of standardization is that IoT-specific standardization will move up the application stack (and the value chain). IoT service enablers that abstract away the complexity of lower level technologies and protocols will provide the fabric that application developers use to create and manage applications. Over time, standardization will embrace data (for economies of scope) and resource (for economies of scale) interoperability. As a result, standardization will evolve to cover functions related to analytics, data models and semantics. In terms of managing business risk, companies may still favor proprietary solutions as a market entry strategy. However, their business plans need to factor the possibility of technology migration or comprehensive change-out costs, especially for extended time-horizon deployments. Open standards can mitigate some of these risks by creating the conditions for a competitive eco-system and a vibrant supplier base to offset the potential for vendor lock-in.